PICTURE YOURSELF ON A PRIVATE ISLAND, lost in the Caribbean and forgotten by the world. No modern conveniences, no schedules, no problems. 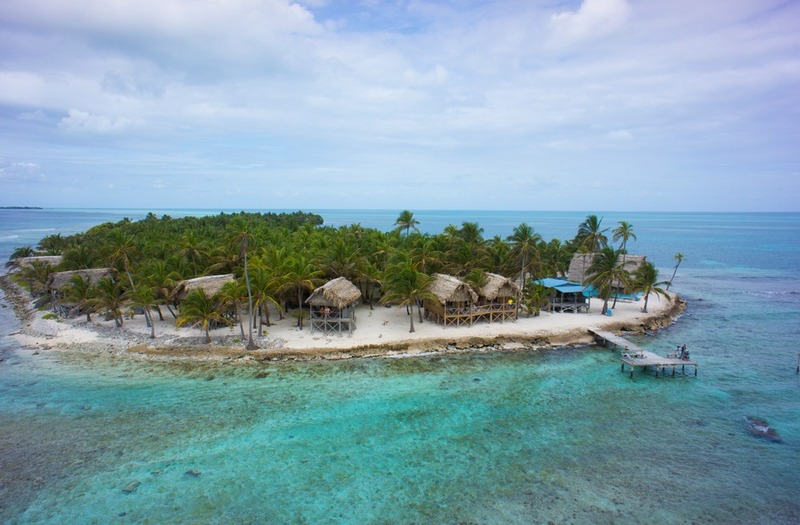 It sounds like a fantasy, but you can experience it yourself on Long Caye Resort in Belize at Glover’s Reef. 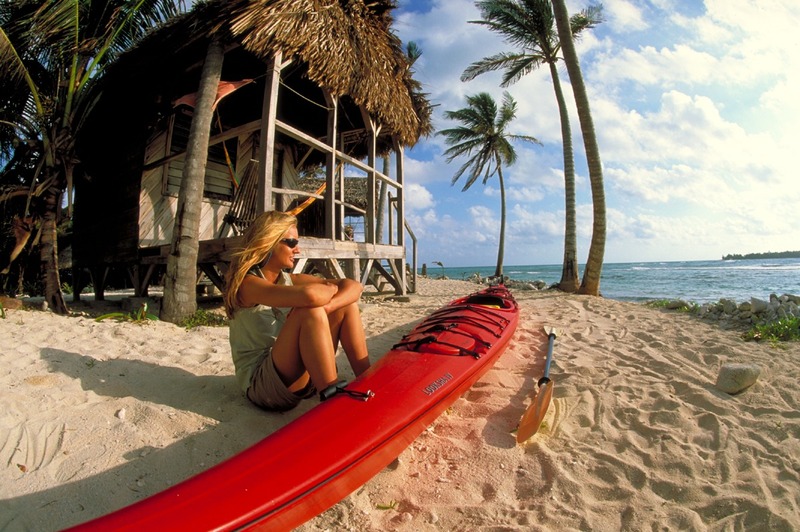 This is the best of adventure travel deals in Belize! Because everything is included, you don’t even need your wallet for the whole week! These are the best adventure deals you can find in Belize. There are no hidden costs, because everything is included you don’t ever find yourself wondering if you should have that second beer… the beer is part of the package! We include just about everything. 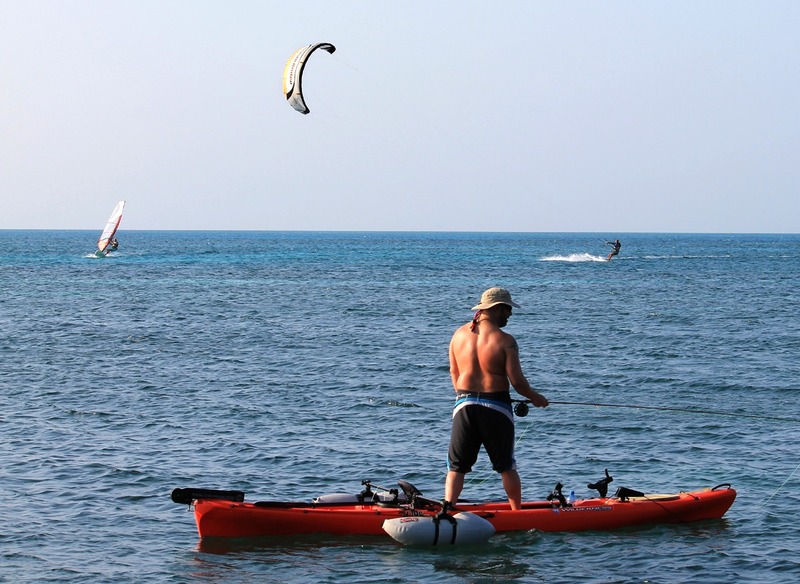 Not only do we teach you to kayak, windsurf, snorkel, surf, etc., but guided activities to practice what you have learned are available all day, every day. Our menu is fantastic, the food is plentiful, and snacks are available all day long as well. Each day we introduce a new sport. We begin by paddling to a magical snorkeling site. Another day finds us in surf kayaks surfing the only surf wave in Belize just off our shore, or scuba diving Long Caye Wall. At night we enjoy Belizean home-cooking. Slickrock spares no effort to ensure that our tour is the best eco tour in Belize. 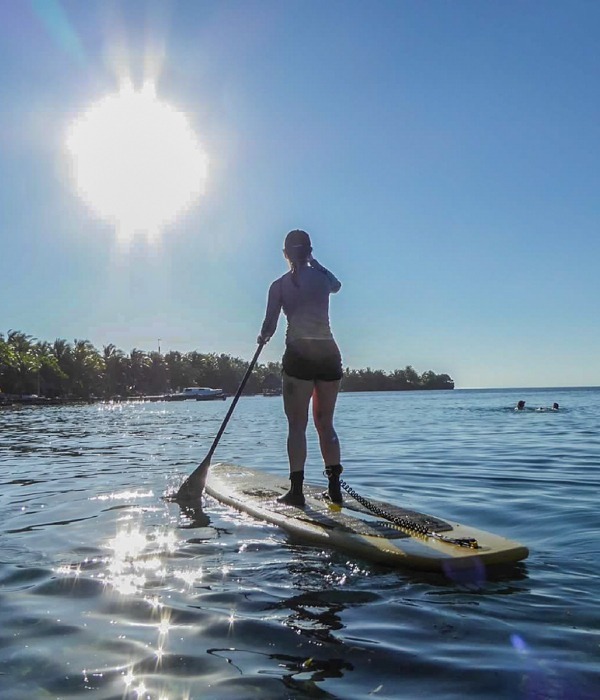 In addition to the luxury of a secluded, private island with arguably the best beach in Belize, our gear is top-notch: we have surfboards, a fleet of 40+ sea kayaks, fishing and surf kayaks, paddleboards, and windsurfing gear for all ability levels. 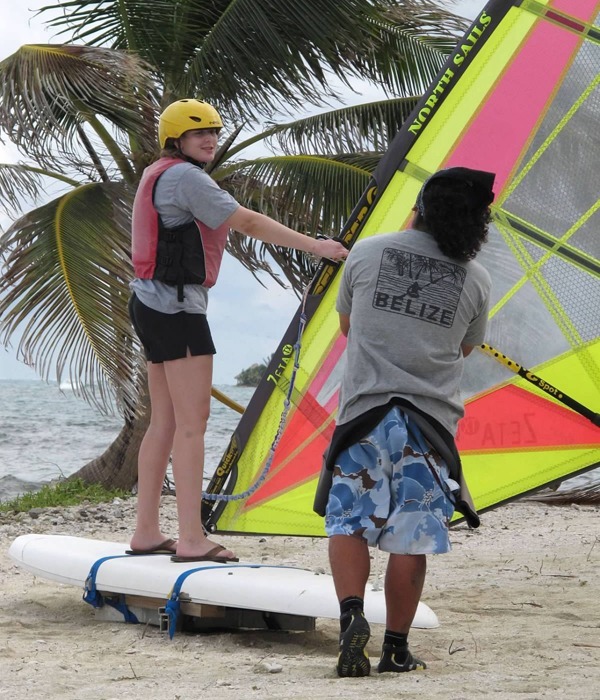 Our kitesurf school offers professional instruction and Belize dive packages are available just down the beach for both certified divers and beginners. We have the only Vela kitesurf school in Belize. When we say multi-sport, we mean it! Our guides are among the most experienced professionals in the business. 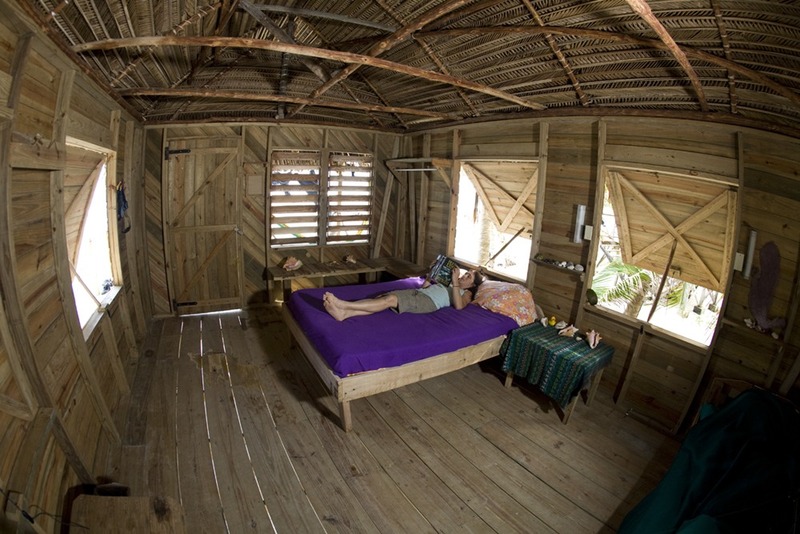 Our facilities are rustic, private, and comfortable; featuring thatch-roofed Belize beach huts perched right on shore. We have a rainwater collection system for drinking water, unlimited showers pumped by the sun (air temperature), and ecologically-friendly composting toilets. Our menu consistently receives rave reviews, and cold beer and soda are included in the trip price. Our boat leaves right out of Belize City for our guests’ convenience. 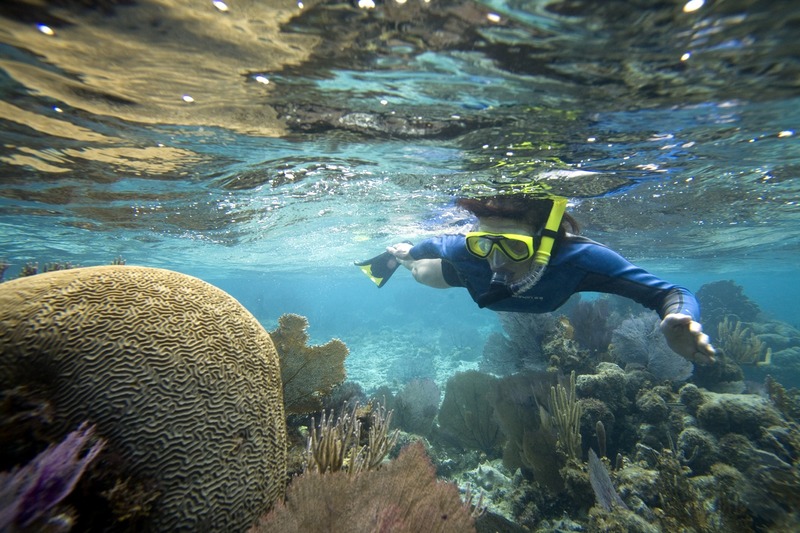 This trip is designed for those looking for an active Belize vacation, although no experience is required. Each sport is introduced, taught, and guided by expert guides, and each sport is suitable for a complete beginner in good shape. People who are in decent physical shape and have a good attitude will do fine. Hundreds of our guests have commented that this is the best vacation of their lives. Come see for yourself why our guests return year after year! HOW TO GET THERE: 15 minute cab ride from Belize International Airport (approximately $30 US). Guests are responsible for their own transportation to the Biltmore. There is no need to arrange a pick-up in advance, cabs are waiting when flights land. We do not offer individual days purchased separately, additional time on the island is booked in half-week increments. If you book more than 7 nights on the island, you will receive an additional discount. Visit our extended stay deals page. Diving Age Limits: Min. 8 If you wish to bring children under the age of 3 on the Adventure Island at Glover’s Reef, this may be arranged by both talking to our office beforehand, and by hiring a babysitter, read more about that option below. Please note: we require that all kids visiting the island are already potty-trained. If you are over 80 and wish to join us on the island, please contact our office to discuss. Weight Limits: Sometimes prospective guests ask if we have boats that can hold a person of 240 lbs, for example. This is difficult to answer because it depends on the fitness of the individual. In general, persons over 200 lbs will not be able to do every sport we offer, unless they are young and very active already. Here are our best estimates for weight limits for each sport: river kayaks: 225 lbs; sea kayaks: 225 lbs; surf kayaks: 200 lbs; windsurfing: 225 lbs; fishing kayaks: 225 lbs; kitesurfing: 210 lbs, surfing: 200 lbs. Height Limits Our gear does not extend to accommodate every single height. We do have 2 sea kayaks for “tall men”, but they do not work for very tall people. We asked Sam Sturman, our tallest guest ever, to write about his experience on the island; here is his explanation of how our program works for very tall people: “I attended the adventure island trip on February 8, 2013. It was an amazing week. What is unique about my experience is my height: 6’ 9” and weight 235 lbs. and a 36 inch inseam. I wasn’t able to fit into a sea kayak because you have to sit in the seat and then put your legs in and my legs wouldn’t fold up that much. 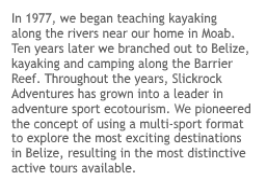 I was able to use one of Slickrock’s fishing kayaks and that worked fine for paddling and going off on snorkeling adventures. I wasn’t able to do surf kayaking because my legs were too long for the kayak and my bent knees interfered with my ability to paddle. I tried using a ‘Versa Board’ that looks much like a paddleboard, but I as unable to ride the waves. I did paddle out and watched the wave surfers. If you are over 6’ 4” you are going to have to understand that your height might be a factor in certain activities. Kid’s love our trips! 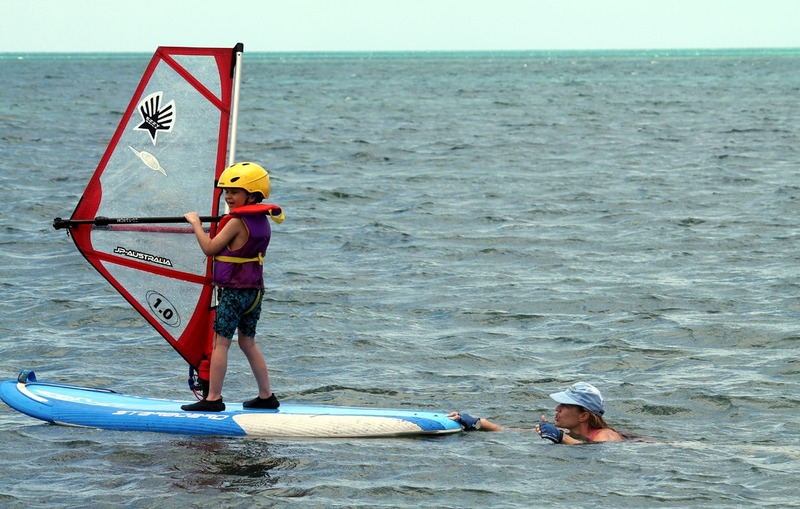 Read more about kids on our island trips by visiting our Belize Family Vacations page. Our Belize guides are carefully selected from the most experienced professionals in the business. 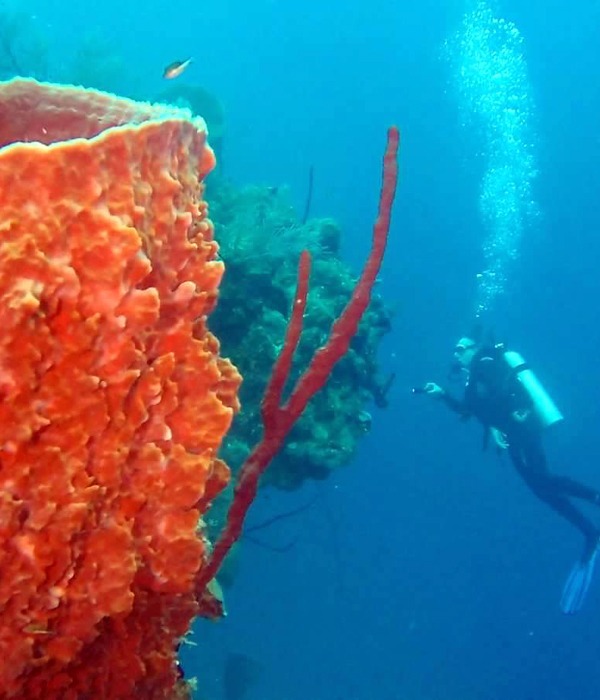 Belize dive lessons and certified dives are at an additional cost. Our island facilities are rustic, private, and comfortable, featuring two-person, Belize bungalows on the beach and spaced for privacy. We first moved from Placencia, Belize out to Glover’s Reef Atoll in 1992. Our kayak adventure out of Placencia was run like a river trip, kayaking from island to island, camping out, and cooking over an open fire. We wanted a little more permanence on the island, but our goal was to create a facility that feels non-developed. Obviously when you build a building, that is development. 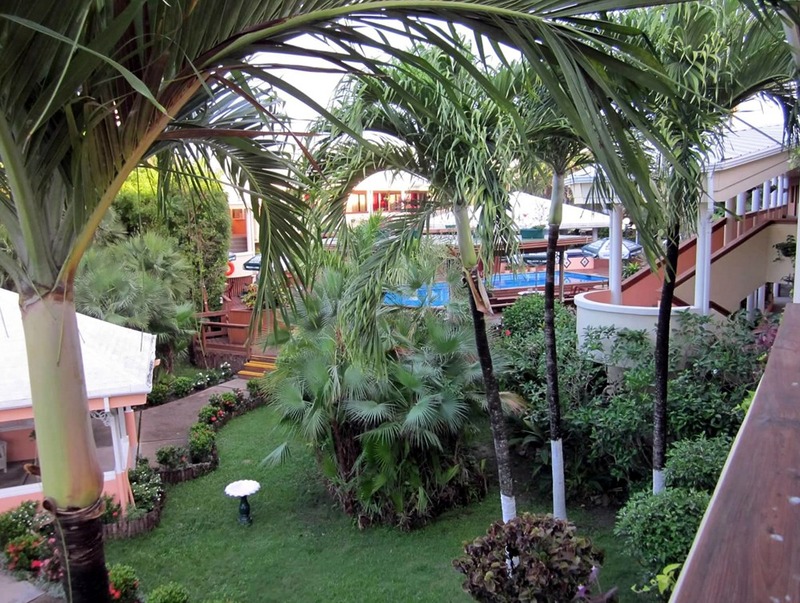 But we created a resort that is exactly where WE would want to go on vacation … five star camping! On Long Caye, development means sixteen cabanas, a well-stocked kitchen, solar-powered water pumps, a composting toilet, a hammock palapa, a dock just for watching the surfers as well as the sunrise, three dozen sea kayaks, a bunch of sailboards, surf boards, and surf kayaks, a kitesurf center, and a dive shop (the only thing not owned by Slickrock). There is no air conditioning, maid service, wifi or cell phone service, and no flush toilets (since we only offer eco tours in Belize, we make sure we flush nothing into the sea.) But there is a fridge permanently loaded with Fantas and Belikin beer, and your cabana sits just feet from the Caribbean Sea. It’s the best in adventure travel — right down to the fabulous Belizean guides who teach you to surf all day and then sit down with you for dinner. Depending on your past experience, our island facility is either the most comfortable camp or the most rustic resort you have encountered. We maintain the island in as natural a state as possible, and there is no standard electricity or plumbing. Think Swiss Family Robinson, or Gilligan’s Island. Every cabana is right on the shore and the tropical breezes keep the temperature well below what they register on the mainland (see Belize temperature). This all adds up to one of the best beach resorts in Belize. Each cabana has single or double beds, a solar-powered light, and a porch with hammocks and lounge chairs (see the island accommodations page for more photos and information). Our dining hall features solar and wind-powered lights and music, propane stoves and solar-powered refrigerators to chill our water, beer, soda, and wine… as well as our extensive library. We drink filtered rainwater, and we bathe with well water pumped by the sun (not heated, the showers are about 75 degrees). Composting toilets complete this ecologically friendly set-up. Our spacious island (13.5 acres) and idyllic facilities ensure your comfort without compromising the adventure of living on an undeveloped and uncrowded island. Best of all, there is a hammock waiting for you under the palms. See our island facilities page for more detail. Every Adventure Island experience includes a Digital Detox. No phone calls or Facebook! Wake to the sounds of nature. You will experience a wonderful thing: Island Time. Visit our private island page for more photos and maps of the island. The Belize Biltmore Plaza Hotel is where we stay the first and last night of the trip. We meet there late in the afternoon on Day 1, so that we are right by our dock to go out to the island the first thing the next morning. At the end of the trip, we don’t get off of the island in time to catch an international flight, so we stay there again. Both the first and last night are included in the trip price. The Biltmore is a full-service hotel located in the suburbs of Belize City, on the international airport side of the city outskirts. The Biltmore has a business center, beautifully landscaped courtyard, swimming pool, restaurant, bar, gym, gift shop, tour desk, and internet cafe. It’s perfect for guests who arrive early, stay late, or who have just a few extra hours in the city. If you have more than one extra day, see Things to Do in Belize. Visit our Belize City Hotels & Restaurants page to see special Slickrock rates at the Biltmore and for contact info if you need to book extra days there.